Santa Claus is coming to town as part of our preschool counting games. He dots the night with brilliant lights for all those near and far. While the rest of the Zapzapmath ecosystem settles into deep and relaxing slumber, you have other plans. Counting the stars up in the sky has left you buzzing with ideas. What if you could pluck them down, and give them to the entire town? What if mathlings could hold the stars tight, locked in a jar of dreams so bright? With the wonder of good dreams in mind, you wander into the night. Equipped with a jar to catch the stars, you are as ambitious as a kite. How many did Santa drop? - you wonder quite aloud. Could he, would he, bring you more to provide for an entire crowd? To start counting and collecting the stars, you need to tap on the stars one by one. Each star that you tap will light up, while the remaining stars wait in the dark until it is their turn to shine. As you tap, a number will appear to help you count. 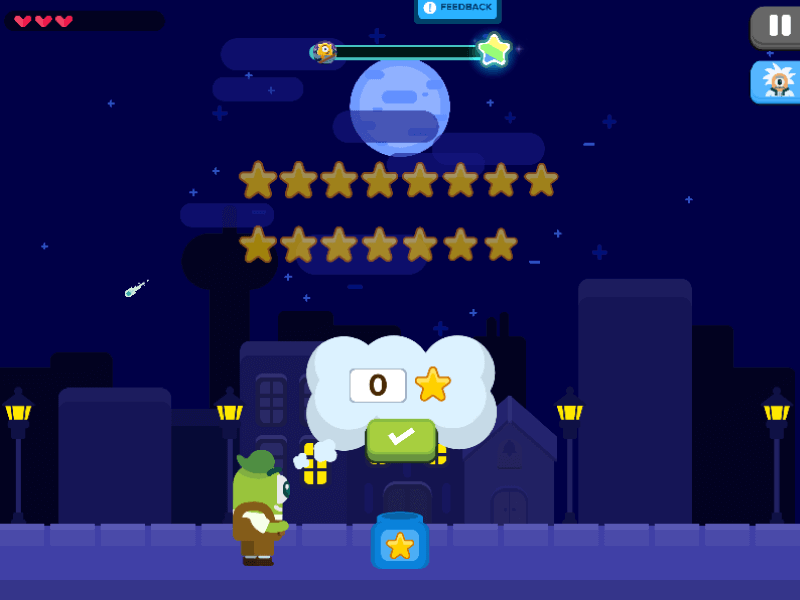 Once you have tapped every star in sight and summed up the amount, click on the green button to submit your answer. The right answer will amount in a beautiful collection of stars in a jar, but the wrong answer will have all the stars you have collected escaping the jar! Every star matters, so make sure you try and try again until you have counted them all in! Counting Stars is one of our preschool counting games that fosters exceptional number recognition skills. Number recognition is the ability to recognize and name numbers. A solid foundation is vital, and building on strong beginnings with lessons such as number recognition is a significant step towards math literacy, thus our preschool counting games focus on creating a solid foundation in the player. In this game, you will learn to distinguish numbers 10 and beyond, a good place to start in our selection of preschool counting games. The early stages of studying numerals is to understand the amount each figure represents, which is why it is important to learn from basic day-to-day activities, such as collecting objects. By collecting objects, you are applying numerical awareness with critical thinking and attention to detail. With every star collected, you are encouraged to notice and name the numbers shown. Counting along will strengthen the learning experience, and develop number recognition on an intuitive level. Recognition of numbers through groups of objects supports the second part of the experience in this game. Through the practice of counting the stars, a connection grows from consistent recognition of specific amounts and their numeral counterparts. This expands sensitivity to quantity, and allows basic addition to be introduced in a fun, playful, and progressive manner. Now that you know what Santa is bringing, grab those jars and start star counting! It’s time to count your lucky stars!